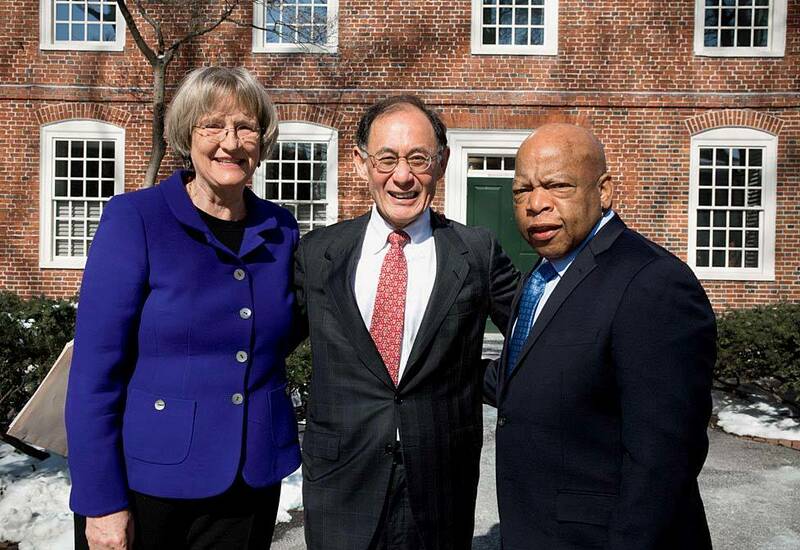 On April 6—drawing on research conducted by the student-inspired Harvard and Slavery Project—Corporation Senior Fellow William F. Lee, President Drew Faust, and U.S. Representative John R. Lewis, LL.D. ’12, spoke to an audience at Dudley House before unveiling a stone tablet affixed to Wadsworth House, acknowledging the four enslaved people who lived there when Harvard presidents Benjamin Wadsworth (1725-1737) and Edward Holyoke (1737-1769) were in residence. 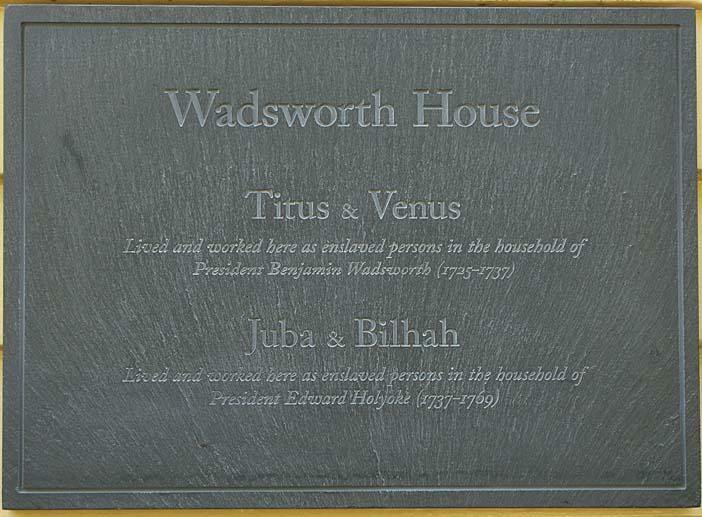 The simple plaque memorializes Titus, Venus, Juba, and Bilhah, and is meant to be the first step in University acknowledgement of its connections to slavery; read a full report. At the end of April, Yale announced that it would retain the name of Calhoun College, its undergraduate residence named for U.S. vice president John C. Calhoun, the fervent proponent of states’ rights, nullification, and slavery (and would initiate historical study of his legacy). It named two new residential colleges—being built to accommodate an expanded student body—for African-American civil-rights activist Pauli Murray (who was denied admission to Harvard Law School for advanced study, in an era when it was not coeducational; see “Two Women, Two Histories”) and Benjamin Franklin, a slaveholder who became an abolitionist late in life.…Separately, Princeton decided to retain the name of its Woodrow Wilson School of Public and International Affairs, and of the similarly named residential college, and to examine the former Princeton and U.S. president’s segregationist history. The University announced on May 23 that Stephen Blyth, president and CEO of Harvard Management Company since the beginning of 2015, has begun an immediate medical leave. Chief operating officer Robert Ettl will be interim CEO, overseeing the endowment-investment operations. Details are at harvardmag.com/blythleave-16. Harvard Graduate School of Education has received a $35.5-million gift, the largest in its history, from the Saul Zaentz Charitable Foundation, for an early-childhood initiative. Under the direction of Thompson professor of education and society Nonie Lesaux and Kargman associate professor in human development and urban education advancement Stephanie M. Jones, the initiative will conduct a five-year, population-based study of early-childhood development. An academy will advance training of early-childhood educators, and there will be new fellowships and two new professorships in the field. Details are available at harvardmag.com/gsedonation-16. As Harvard expands its academic footprint in Allston, Stanford is redeveloping a former office park into a satellite Redwood City campus, relocating support operations from its academic core. The new venue, five miles from the university’s central facilities and its first such expansion, will by 2019 accommodate 2,400 staff members involved in an outpatient medical clinic, business operations, buildings and real estate, human resources, dining, development, and libraries and archives. Ultimately, the site can accommodate 13 new buildings totaling 1.5 million square feet of offices and clinical space.…The University of California at Berkeley, which disclosed severe budget deficits in February, has announced that it will eliminate 500 staff positions (6 percent of the total) through attrition and layoffs. Faculty members from the departments of astronomy, physics, mathematics, history of science, and philosophy have formed a Black Hole Initiative, the only such center dedicated to the field. Abraham (Avi) Loeb, Baird professor of science and chair of astronomy, is the founding director; cosmologist Stephen Hawking, S.D. ’90, spoke at Sanders Theatre on April 18, kicking off the initiative. Air Force Secretary Deborah Lee James visited campus on April 22 to sign the agreement for its decision to establish a reserve officer corps program at Harvard. That completes a five-year process that began with the return of Navy ROTC in 2011 and the Army a year later, following repeal of the “don’t ask, don’t tell” policy that had banned openly homosexual people from military service. Harvard students’ ROTC training takes place at MIT. Harvard Medical School has reported fundraising proceeds of $539 million as of March 31, up from $512 million two months earlier, suggesting steady progress toward its $750-million goal—and continued gains for the $6.5-billion University campaign overall; a status report is likely by late summer, following the June 30 close of Harvard’s fiscal year.…Separately, in April, the University reported that the Lemann Foundation has expanded its support for financial aid and fellowships for students from Brazil, and will support visiting faculty members and underwrite a Brazil research fund. Jorge Paulo Lemann ’61, a billionaire São Paulo-based investor, made significant commitments to financial aid and research beginning in 2006.) Harvard’s Brazilian ties were underscored in the award of an honorary doctorate of laws to that nation’s former president, Fernando Henrique Cardoso, at Commencement. In reporting on the 2015-2016 academic year, Huntington D. Lambert, dean of the division of continuing education and University extension, observed just how far online learning has progressed. Of 787 courses offered, to 14,500 students (more than 3,000 of whom are pursuing degrees), more than half were online; 42 of those courses included a weekend session on campus. The Extension School offered 13 HarvardX courses, accompanied by teaching support and discussion sections, for credit, and deployed several of its own, internally developed, fully online courses. Pay packages. The University’s annual disclosure reveals that for the fiscal year ending June 30, 2015 (data are reported with a lag), President Drew Faust earned $816,370, plus other compensation (retirement and deferred compensation, the use of the presidential residence) of $386,610. Harvard Management Company’s departed president and chief executive officer Jane L. Mendillo earned $13.8 million during her final 18 months overseeing the endowment. Further details appear at harvardmag.com/compensation-16. The yield. Nearly 80 percent of applicants offered admission to the College class of 2020 have decided to come to Harvard, down slightly from the 81 percent yield reported last year, but the fourth year in a row that acceptances have hovered around that level. As a result, 40 to 50 wait-listed applicants will be admitted. Miscellany. Gap years got a high-profile boost with a May 1 White House news release: “The President and Mrs. Obama announced today that their daughter Malia will attend Harvard University in the fall of 2017 as a member of the class of 2021. Malia will take a gap year before beginning school”—during which the family will, of course, be moving to a new home. (Mom and dad are, respectively, J.D. ’88 and ’91. )…The New York Times and Fortune have both reported that Xfund—the seed-stage venture-capital fund founded by Patrick Chung ’96, M.B.A. ’02, J.D. ’04, and Hugo Van Vuuren ’07, M.D.S. ’12, and initially based at the School of Engineering and Applied Sciences to support ideas originating there—has foundered following disagreements between the two partners about its direction. Among investors in the fund is Corporation member James W. Breyer, a leading figure in the venture-capital industry.…Corporation member Theodore V. Wells Jr., co-chair of the litigation department at Paul Weiss, who has previously represented Exxon Mobil Corporation, has been retained by the company to represent it as state attorneys general investigate whether it misrepresented to the public and investors its knowledge of climate change.…Harvard Magazine congratulates contributing editor Adam Kirsch ’97, a critic and poet who has written in these pages about Robert Frost, Seamus Heaney, and T.S. Eliot, among many other subjects; he has won a Guggenheim Fellowship, to pursue his work on the letters of Lionel Trilling.